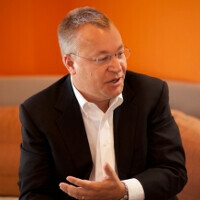 Nokia CEO Stephen Elop was caught on tape not long ago saying "anything is possible" on the question is it possible that the company moves to Android at some point, for either its tablets or its phones. The PR team was quick to release a statement that he had been mistranslated. Speaking in Australia the other day, Nokia's CEO let one slip again, when discussing the possibilities of releasing a tablet, and the eventual mobile OS it will use. "We haven't announced tablets at this point, but it is something we are clearly looking at very closely," he said, and then it became interesting. "Our first focus on what we look at is clearly in the Microsoft side," was the follow-up, while he again stated Nokia "would consider any option," for the horror of the PR people around, who advised he mention "but we have made no decision or announced nothing." Whether these are deliberate efforts or just common sense "never say never" comments, remains to be seen, but in the meantime we can't wait for the rumored Nokia EOS Lumia phone with PureView Phase 1 camera to materialize and take the spotlight off any and all cameraphones out there. While it's the obvious right answer, it's not something Microsoft wanted to hear, who gave serious backing to Nokia not to fall apart. i am a big fan of MS & Nokia. but you misunderstood the relationship of the both. They both had nothing to celebrate of in the near future because they were rapidly fading away. conjunction of both have somehow saved both of 'em. If you take nokia and all the lumias out of the question you wont see that much WP devices in public. without nokia MS cant grow as mobile os, where on theother hand if nokia chooses to go to android it will be the end of monoply of android held by samsung !!! Go Nokia! Make a tablet then make an iconic design just like the Lumia 800, 900, 920! Not if they made strategical commitment with Microsoft. They only recently went full-Windows to separate themselves from the pack which is paying off right now; if they give up the exclusive status entering the saturated Android market dominated by Samsung, they not only risk a failure there, but falling behind on W8 front. As a customer I'd love a 41MP PureView Android with the screen tech of the 920, but from purely a business standpoint, I'd prefer Nokia staying with the platform they currently lead. A loss on both fronts would be the end of the company. They turned profitable because they focused on one OS, would be foolish to go back what almost killed them, right? A huge chunk of Nokia's profit last Q4 of 2012 came from the Nokia Siemens networks infrastructure. The lumia devices has very little to do with it. And it's Q4... consumers tend to spend more during the holiday seasons so we have yet to see if they'll still manage to have profit this Q1. About the topic, I would love to see a Nokia Android phone. WP8 is the only thing holding me back to love Nokia again. Hi Peacekeeper...I'm interested to know what it is you don't like about WP8? I'm not judging here either way but I have only ever had Android phones up until a week ago when I upgraded to the Lumia 920 and I'm not looking back. I don't know why I like it so much...I think it's because it has the simplicity of IOS but with a better looking UI. Android is fantastic in as much as you can customize so much, but I think I analysed what I used mostly on the phone and how I used it and came to the conclusion that there were too many customization options. Glad to hear that you like the Nokia brand / phone though. Why change the platform when they're doing good with it? However, Windows can come up with customizable home screens and translucent/opaque live tiles. Atleast a customizable option on WP series would do Microsoft some good. Wendy, we're talking about Nokia here. They're as mature as they can get... Yes, they can do whatever they want...that is true, that's why i think Nokia can do something about WP. Like different UI's on top of Androids from different OEMs. When you think about it, how exactly can they differentiate from one other? How can they be different UI's with tiles as the main focus? There are only so many things you can do with tiles after all. You couldnt be more wrong, investment was never a problem for nokia when it comes to android. I hope they don't make an Android tablet, there are tonnes and tonnes of those already. They should make an affordable Windows 8 one, that's still a rarity. Nokia hardware and Jolla Sailfish OS? Please? Nokia? Please? Than why the F3$K they let Meego go? If Nokia will use Android i will never buy a Nokia again! Because if Nokia was--after all--going to use Android, then why the heck didn't they? Also a well developed, fully mature MeeGo would crush Android. Probably would have more impact than BB10 has now, being the first buttonless gesture-based UX, with Linux open source. It would have been a massive competitor for Android and would most definitely spank iOS as it is. did you read my comment? if you read it, did you re-read it? and if you done that also, did you get it? cause it doesn't seem like it. i asked him why he hated android, i'm just curious to know. You're assuming he hates Android period. I'm saying he might not like Android for Nokia because it would be stupid, and if they were going Android after all, why didn't they. But given his response, Android to him is laggy.